I don’t support lightening and whitening claims. I don’t but whitening creams ever though I am not fair and have wheatish complexion. We Indians have some fetish for fair complexion and thats why these fairness creams and products are such a rage these days. I personally know some gals out there who buy and try every product that mentions ‘whitening’ or ‘fairness’. So, why did I buy this!! Actually, before my Andamans trip, I went for sunscreen hunt to my local market and there, Organic Harvest was having an exclusive counter. I got their sunscreen and quite liked it. You can see the review here. Then, she showed to me some scrub which was again very good and this cleanser. She told me that this cleanser is very good for oily skin and since I am going to beach holidays, it would keep tanning at bay to some extent. I thought that sunscreen+cleanser combo would definitely help me there. Nope. I was not expecting any lightening. But then, I didn’t even found it to be a good cleanser. My skin never felt good after using it. Being oily, I felt that it left my skin a bit on greasy side. Then, my apprehension came true, I started having pimples in two days. Thank God, that was before my trip. I have stopped using it completely and shifted back to my HG cleanser Cetaphil For OS. Though the cleanser claims to have many benefits like it is paraben free, mineral oil free etc. But it didn’t work for me. 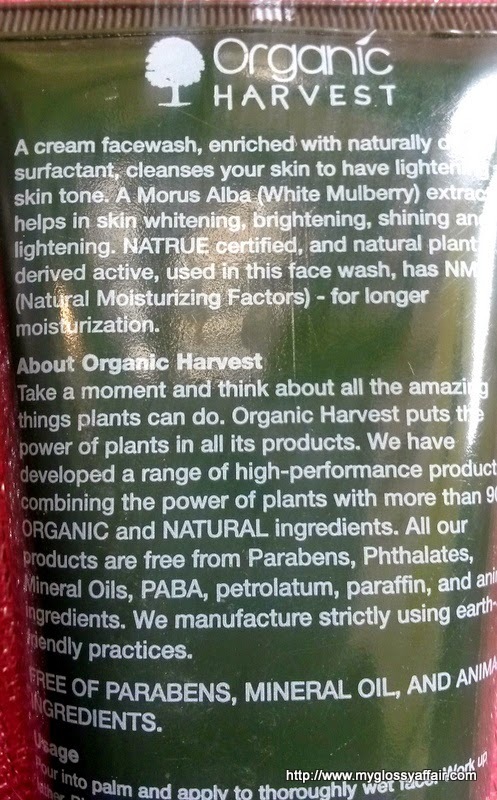 Still, I want to try that body scrub from Organic Harvest but no cleanser from the brand for me again. It comes in a dark green opaque tube with a flip opening. The tube is good and sturdy and locks tightly. It is travel friendly too. The cleanser itself is creamy and whitish in colour and goes on smoothly on the skin. It rinses off well but leaves a greasy feeling to me. It doesn’t remove makeup. It doesn’t lighten the complexion or so as per claims. The smell is too herbal for me but I don’t mind that. If it would have worked, I would have been happy with the smell too. A cream face wash enriched with naturally driven surfactant that cleanses your skin to have a lightened skin tone. The Morus Alba (white mulberry) extract helps in skin whitening, brightening, shining and lightening. Nature certified natural plant derived actives used in this face wash have NMF (Natural Moisturizing Factors) for longer moisturization. Products free from parabens, phthalates, mineral oil, petrolatum, PABA, paraffin etc. Quite sturdy tube with tight flip open cap. Doesn’t cause any stretching, makes skin smooth and soft. Doesn’t contain parabens and other harmful chemicals. May suit dry skin well. It leaves my skin a little bit greasy. Doesn’t suit my oily skin. Caused breakouts. Causes no whitening or lightening. I would not buy this one again. My current one is also lying waste. Maybe I can use that in winters or will give it to someone. If you really believe in Organic Harvest, then gals with dry skin can definitely give this a shot. I know their products are good enough but this cleanser failed on me. Oops.. good to know that it does not work ! Well reviewed hon ! I have never heard of this brand and thank you for your honest review. I followed you back. Do you wanna follow each other? Please let me know!!! I start to follow you now! Oops! I will skip this if it breaks out. of course follow each other, I start now on GFC, google+, facebook and twitter! Hope you'll follow me back! oh my what a dud product. i agree ppl are so crazy for fair skin! Oh sad it didnt work! I will stay away! Very nice and informative review Charu … I belong to a combination skin and hence will skip this one. Oh no that's no good. I hate when I try something new and my skin reacts badly to it. That's why I usually stick to what I use and know lol. Hope you have some luck with the body scrub! i like herbal smell , so it looks perfect!! I'd love to try this product myself! Oops it was a dude!! I loved your honest review dear. I have used one such product which is quite similar to this. Will review that soon.